Blocked drain Guildford, Godalming or Aldershot? AB Drainworks are a professional and completely independent drain specialist, fully equipped to help with your blocked drain Guildford, Godalming, Aldershot, Gomshall and throughout the wider Surrey area. Our drainage services include CCTV surveying, high-pressure jetting, drainage repairs, groundwork and water main repairs. We can help with emergency drain cleaning, and offer a rapid response 24 hours a day, 7 days a week. We can even help with insurance claim work, where required. Call us today, and we will help you with your blocked drain in a fast, efficient and professional manner – check out our Checkatrade score for drainage work by clicking on their logo below! 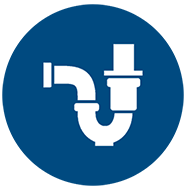 To arrange help with your blocked drain, please call our friendly, professional team today on 01483 323204, or mobile 07917 726634, and we will be really happy to help. Alternatively, please feel free to use our contact form below, and a member of the team will respond to your enquiry as quickly as possible. If you would like to get in touch with us, please complete your enquiry details into the contact form on this page. Alternatively, if you prefer, please use any of the details below to contact us. AB Drainworks can help with your blocked drain in Guildford, and throughout the Surrey area. We provide an emergency call-out service 24 hours a day, 7 days a week – so if you need urgent help, just give us a call using our contact details as shown above.